There is no better time than the summer time for any senior to get up and challenge themselves to start getting healthier and more active. This warm-weather season, we challenge seniors of all ages and abilities to get up and get moving each and every day with these easy, yet effective summer exercises. Squats are a great way to promote flexibility and strengthen the hips and hip flexors, which can be very important for many seniors. Find a standard size chair and stand over it with your feet hip with apart. Slowly squat down as if you were sitting, touch your bottom to the chair and then stand back up. Make sure to sit back and push you bottom out while keeping the back straight so you don’t hurt yourself. Always check your toes to make sure your knees are not extending over the end of your feet. Sit on a comfortable chair, keeping your back straight and your knees bent. Extend one leg in front of you and hold for several seconds. Lower it back to starting position. Repeat ten times and then switch legs. This is an exercise that strengthens the knees and legs and can help you lessen your chances of falling. Want to really push yourself? Add some weights around your ankles for more resistance. This may seem like a childhood game, but balancing on one leg is actually a great way to build abdominal strength and work on balance and coordination. Moves like this are often used in yoga to help build a solid core. This can help seniors prevent falls and have better posture. Stand with your feet shoulder width apart, next to a high back chair that you can use to station yourself. Lift one ankle behind the knee and gradually remove your hand from the back of the chair until you can balance. Start with five seconds and then work your way up to challenge your balance even more. Good posture and neck and back mobility is really important for any senior. The hummingbird is a great exercise to loosen up the muscles in the neck and the back and keep the neck and your posture looking great. Lift your arms above your head, rotate your palms to face outward and place your fingertips right on the edge of your ears. Stand up straight and take a deep breath in and start rotating your arms in small circles so they look like the wings of a butterfly. Do this for 30 seconds. Rest. Repeat three times. Cardio is really important for all seniors and this cardiovascular exercise is so simple and easy yet so effective for seniors. It can help promote good heart health and help seniors maintain a healthy weight. Stand on the bottom of a staircase and hold on to the railing for balance, if needed. Take one step up to the first set of stairs, bringing both feet together. Then step back down. Repeat this ten times. Take a break and then do two more sets of ten. Every senior should challenge themselves to try these exercise each and every day. 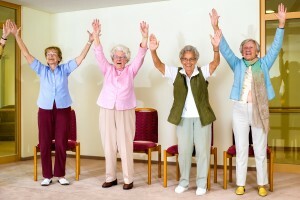 These five simple exercises can really go a long way in promoting a healthy weight, better posture, improved range of motion and a better overall quality of life for any senior who is ready to take on the challenge and start exercising today.